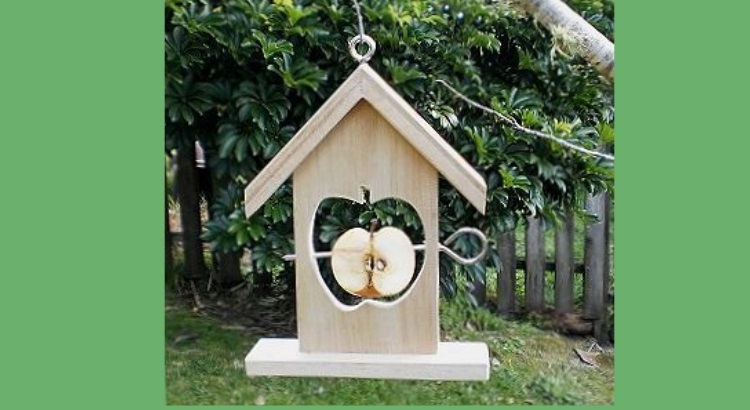 The following bird feeder is simple to make, requires very few tools and costs very little. 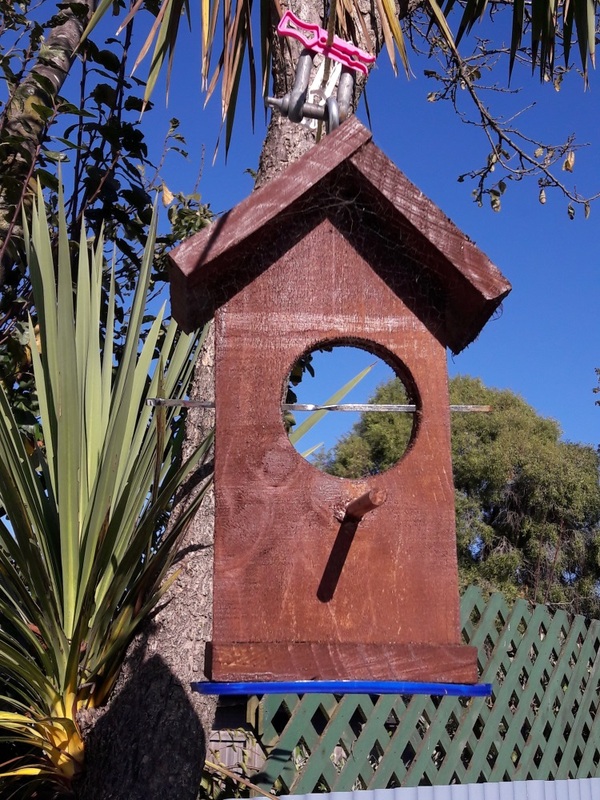 We adapted some ideas we had seen and turned out this feeder as part of Dementia Canterbury’s twice monthly wood working group who meets at Bunnings Shirley. The parts of this bird feeder can be glued and screwed together or else can be nailed. The wood doesn’t have to be fence paling wood (H3.2 treated) as we have also made these from pallet wood, plywood and other scrap wood. however we were making 12 of these at one time so fence paling wood was both cheap and a nice standard size. 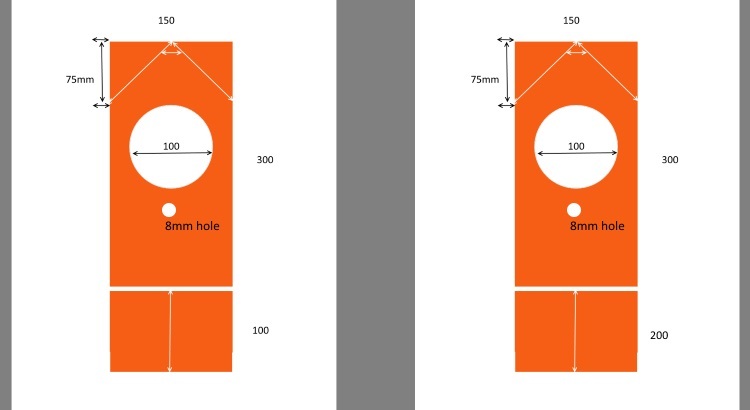 With the 300mm piece, measure 75mm from the top down the side on both sides. Draw a line from these marks to the middle of the top of the piece of wood. These make a 45 degree angle from the top of the wood down the sides. This is the angle the roof will sit at. Cut off the two triangles you have just marked out. From the top of the roofs point, measure 125mm down and 75mm in from the edge. This mark will be the centre mark for drilling the feeder hole. Using the 100mm diameter hole saw, drill a hole through the wood, using the mark above as your centre mark. HINT: Drill half way through the wood with the hole saw. The centre drill will have gone all the way through. Turn the wood over and then place the centre drill in the hole and complete the 100mm hole from the other side. Doing this gives you a tidier hole. Drilling the 100mm hole from one side often results in torn out wood on the back but drilling from both sides keeps it tidy. Using the 8mm drill bit, drill a hole 125mm from the top, through the side of the wood into the circular hole. Repeat on both sides. These holes will allow the skewer to be pushed through the hole to hold food. A) Cut the 100 x 150 in half so you have two of 100 x 75mm boards. If you choose this option the roof will touch in the middle but it will have a V shaped gap where he two boards touch. B) Alternatively Cut the 100x 150 into two equal sizes as above but then trim one piece to be 75mm by 75mm. 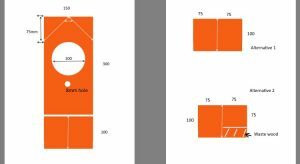 This means the of 100 x 75 will overlap the 75mm x 75mm board by 25mm. This will give you a roof overlap as shown in the photo. This looks better but is slightly harder to drill the hook / hanger hole through. Test fit the two roof pieces on the 45 degree cut slopes on the larger board. If they fit then glue and screw them in place. HINT: If you used option B above, glue and screw the two roof pieces together but dont fit it on the larger piece yet. Turn it upside down so it looks like a V and drill a pilot hole for the hanger hook through the middle of the roof. Then fit it to the larger piece. Push the 8mm dowel through the 8mm hole from front to back as a perch. 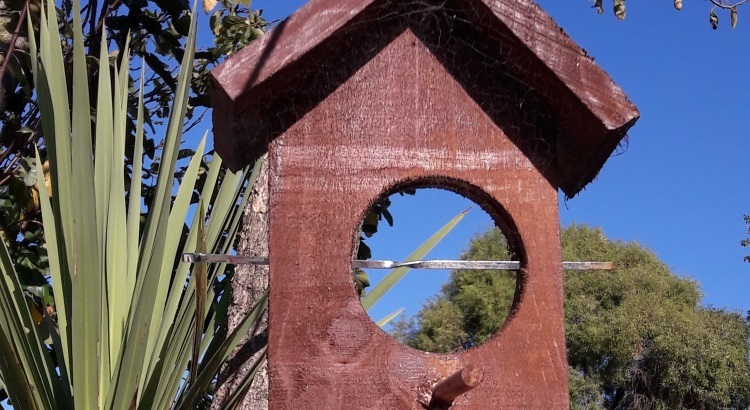 Screw in the hook / eyelet, screw or bent nail into the top of the bird house to hold it. You have two triangle pieces of wood left over. Some people glue those below the 100mm hole instead of the dowel. this gives the birds a platform rather than a perch. If you use a 150mm x 500mm length of wood instead of the 150mm x 400mm wood you can cut a second 100mm x 150mm piece off the bottom. Glue and screw that to the bottom of the bird house to make a foot / stand. Peeled (or unpeeled depending on how soft you are) apple held by the skewer, butchers bird feed (fat scraps bag), fat and seed mixed together, fruit, old bread / scones etc all make fine items to skewer and put into your feeder. Send us a photo if you make these. We would love to see your creations.